The real estate market has embraced mobile technologies as a way how to make life easier for agents, home buyers and sellers, investors, and even tenants. All applications on this list are available for free, so the only thing you need is your smartphone or tablet. 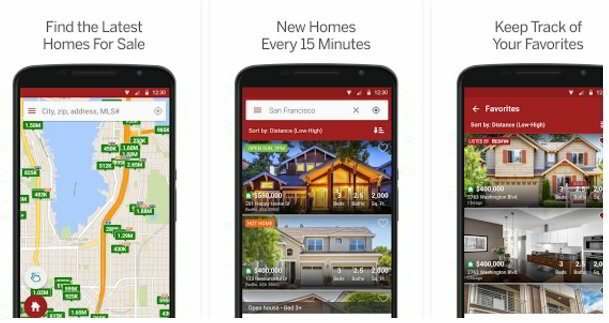 The Redfin Real Estate App is our favorite Android application for home buyers. The app can turn the otherwise exhausting activity into an enjoyable experience. It comes with an accurate database of MLS real estate listings, which are updated every 15 minutes to give users the most accurate information possible. You can configure the application to send you push notifications about whenever a new house is added to the database or when a house gets discounted. As you search for houses near you using the built-in map or customizable search functionality, you can save your favorites for future use or instantly schedule tours right from the application. Redfin share their industry knowledge by telling their users which houses are likely to sell fast, and Redfin Real Estate Agents write detailed comments based on their actual experience with the houses they comment on. The company has been in business since it was founded in 2004 by David Eraker, Michael Dougherty, and David Selinger. They differentiate themselves from their competition by charging only 1.5 percent listing fee, instead of the traditional 3 percent fee. This allows them to offer better returns to their customers. To ensure high quality of service, they pay their agents a salary and tie bonuses to customer satisfaction. Zillow has recently made the headlines, because its CEO, Spencer Rascoff, paid almost $20 million for a six-bedroom mansion in Brentwood, which is more than $1 million more than what his own real estate application estimate the house to be woreth. To be fair, nobody really knows for sure what negotiations took place. But one thing is for sure: Zillow has received a 5-star rating from more than 180,000 users and the total number of downloads is well over 10,000,000. The application is a fantastic companion who anyone who is looking for a new place to call home. Search results can be limited by typing an address, selecting a particular neighborhood, toggling various filters, or by drawing a custom region on the map. Users can then view video walkthrough to instantly get a better idea of how the house looks like, and scheduling a meeting with a Zillow Agent is just a click away. But Zillow goes a few steps beyond being only a database of available homes. Instead, the app is a comprehensive toolkit of useful tools, including mortgage calculators, access to foreclosure listings, and the ability to get pre-approved for a loan. Premier Agent is another application from Zillow. This time, it’s purpose is to help agents simply and effectively manage their leads. 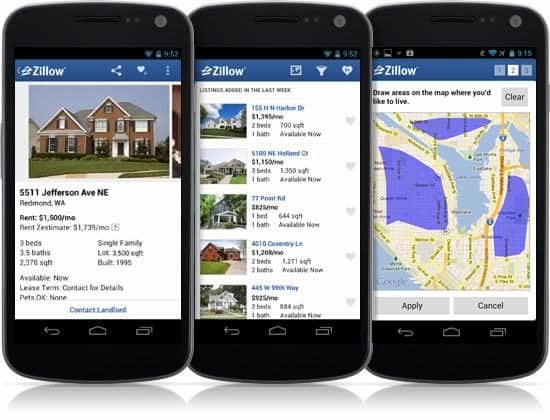 The application was developed based on the feedback that Zillow received over the years from their agents. Their main wish was to have a tool that would help them stay on top of their inbox and promptly respond to their clients from anywhere. This is now finally possible with Premier Agent. 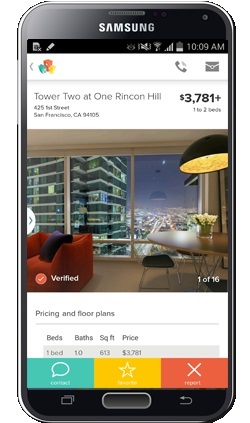 The app supports push notifications for instant alerts whenever a contact is received from Zillow and Trulia. All information about your contacts are presented in a single place, so you can better prepare for your meeting and provide clients with the best service possible. The app also allows agents to add a video walkthrough before the listing is posted online, using the new Property Search feature. Listings with video walkthroughs receive extra email marketing and they are proven to attract a lot more viewers. As far as lead management goes, the app uses a status-based system, which gives agents the ability to mark contacts based on their readiness to close the deal. It can also record phone conversations, so you never miss any important details. As such, Premier Agent is a must-have tool for every Zillow Agent. 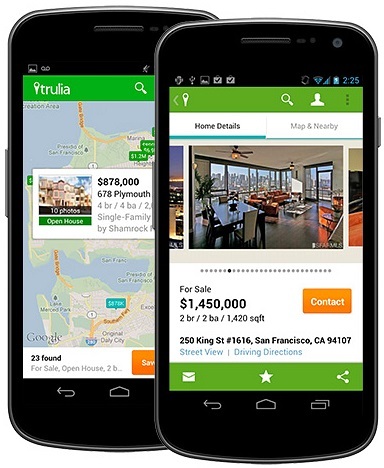 Founded in 2004 and headquartered in downtown San Francisco, Trulia is an online residential real estate website and application that makes finding the ideal home very intuitive and convenient. The company was actually acquired by Zillow in 2014, which is why it’s compatible with Zillow’s Premier Agent application. Since the acquisition, Trulia has become very similar in the scope of its features to Zillow. It’s possible to search for houses using keywords or MLS numbers; perform custom searches by price, lot size, number of bedrooms and bathrooms, or neighborhood; and use GPS to quickly discover which houses are available for sale in the area. Results can then be organized using the virtual pinboard, which stores everything in an organized fashion for later use. From there, it’s just a few taps to access the built-in mortgage calculator to calculate your mortgage, or open the crime maps to see an accurate crime map of any neighborhood in the United States. If you own an Android Wear device, you will be pleased to know that the application is able to use it for home alerts, among many other useful things. The only reason why you might want to first try Zillow’s app is that we feel like the company prioritizes its development over Trulia. That’s not to say that the app is buggy or lacks features – far from it. It’s just that from a business point-of-view, it doesn’t make much sense to maintain two nearly identical applications at the same time, making us believe that Trulia might be discontinued in the future. HotPads is another company that was recently acquired by Zillow for $16 Million. As such, it includes Zillow’s Rent Zestimates (estimated monthly rent price, computed using a proprietary formula) and also Walk Score’s Walkability Score, which helps users find a place that is easy to get around on foot. Places that receive a score of more than 90 do not require a car to accomplish daily errands. You may also stumble upon a Transit Score, which measures of how well a location is served by public transit, and Bike Score, which measures whether an area is good for biking. So why would you want to install yet another real estate application managed by the same company? Because HotPad offers a streamlined user interface that helps you accomplish what you need to do in the shortest possible time without bombarding you with features that you might never care about. It’s a shame that Zillow have decided to shut down HotPads Answers, which was once a very active question and answer community of buyers, sellers, and real estate agents. Its replacement is called Zillow Advice. A good news is that you still get the same functionality only with Zillow’s branding. Another subsidiary of Zillow, StreetEasy, provides for-sale and for-rent listings and information of real estate properties in New York. The company was formally named NMD Interactive, Inc., but they changed their name in 2013. Because the application focuses on a much smaller group of users, it can provide with the most comprehensive database of real estate listing in all boroughs f NYC. You can narrow down you searches by price, location, amenities, or, for example, individual buildings. Each property comes with a full history, allowing you to see how long it’s been on the market and whether there was any recent activity. This can be very handy if you would like to screen for apartments with a high turnover of people – a common sign of a low-value property. The application is constantly updated and new features are being added to it on a regular basis. The latest version supports Android 4.0 and higher. Zumper is one of the youngest real estate applications on this list. It was founded in 2012 by a team of two former real-estate agents, Anthemos Georgiades and Taylor Glass-Moore, and two former Google software engineers, Russell Middleton and Leah Jones. The app started with a $1 million seed round and has since raised a $6.5m Series A investment led by Kleiner Perkins Caufield & Byers, according to TechCrunch. The main goal of Zumper is to become the go-to tool for brokers and apartment managers to use when they want to list their properties online. This, in turn, enables it to be a great way how apartment hunters can find the place they are looking for. Zumper comes with a ginormous database with more than 1 million apartments, houses, and condos. This database can be filtered by price, number of rooms, pet policy, amenities, location, parking, any many other more specific options. Alerts are handled in a very interesting way: Users create a map of their interest and the application then starts monitoring this area for changes. Once a change occurs, the user is promptly alerted via a push notification message. Each apartment comes with contact information for the corresponding landlord, so users can ask for details no matter where they are. But, by far, the best thing about Zumper is its One Tap Renting feature. Gone is the requirement to get through complicated paperwork – now you can apply for your new home digitally. 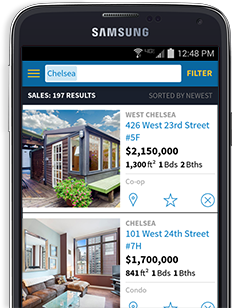 Realtor.com is known to sell more homes than any competing platform, and the company is now ready to take on the mobile market with its new Android application. When you first start the application, you are encouraged to search by address, city, zip code, or draw your own custom search area directly on the map. From there, the app presents you with a list of results, each containing high-resolution pictures and additional information. With a support for real-time notifications, there’s no chance you ever miss an update or price reduction. The developers claim that up to 90% of property listings are updated every 15 minutes. Other real estate and rental listings are updated at least once per day. One feature that you don’t find anywhere else is the ability to pair Realtor.com with Google Chromecast to stream the content of the on your TV. It goes without saying that this way of searching for the right apartment or home is much more comfortable than squinting at your smartphone. Homesnap is powered by a clever technology that allows users to take a picture of any home to reveal home value estimates, interior photos, beds, baths, taxes, lot boundaries, school ratings and much more. Alongside more typical search options is the ability to search for homes by school attendance zone. Real estate agents can use the application to keep track of all the homes they’ve discussed with their clients in one place. Furthermore, Homesnap Pro agents gain the ability to directly contact other agents who are using the application – something that can be useful for networking purposes. To use the application, your device must run on Android 4.0.3 or higher. Our only two complaints about the applications are that it requires you to log in before you can accomplish any meaningful actions, and that it comes with in-app purchases. Previously known as Walk Score, Neighborhoods & Apartments is a clever application that knows how long it takes to get to various locations from the apartment of your choosing. Let’s say that you want to find an apartment that would allow you to get to your work on foot in less than 10 minutes; all you have to do is select the location of your apartment, input your configuration into the app, and you are good to go. All listings come with high-quality pictures that clearly show the interior, and the powerful keyword search mechanism is able to filter even by the type of floor found in the particular apartment. International users will be pleased to know that the app also supports Canada, Australia, and New Zealand.